Washington, New York and S?o Paulo, February 20, 2019 – Cut-rate financing has the potential to substantially speed the transition from fossil-fuelled power generation to renewable energy in developing countries, according to a new report produced by BloombergNEF (BNEF) and commissioned by the Clean Technology Fund (CTF), a program of the $8.3 billion Climate Investment Funds (CIF). That, in turn, could potentially slow or even halt the rate of CO2 emissions growth in these less developed countries. Development finance institutions (DFIs) can lend concessional capital to projects in non-OECD countries at interest rates well below those they might ordinarily offer. Such funds have historically been strategically deployed to support ventures regarded as particularly risky. For years, concessional finance has been recognized as a “secret sauce” for accelerating development of low-carbon technologies in emerging economies. Pairing clean energy with affordable, flexible financing can make infrastructure like wind or solar power more cost-competitive, even more so than fossil-fuel sources. Tipping Point 1: When a clean energy facility becomes cheaper to build than a new gas or coal plant. In developing markets where this has not yet occurred, this could take five to ten years from today to achieve, or even longer. BNEF’s analysis, however, found that concessional finance can shave years off this timeframe. 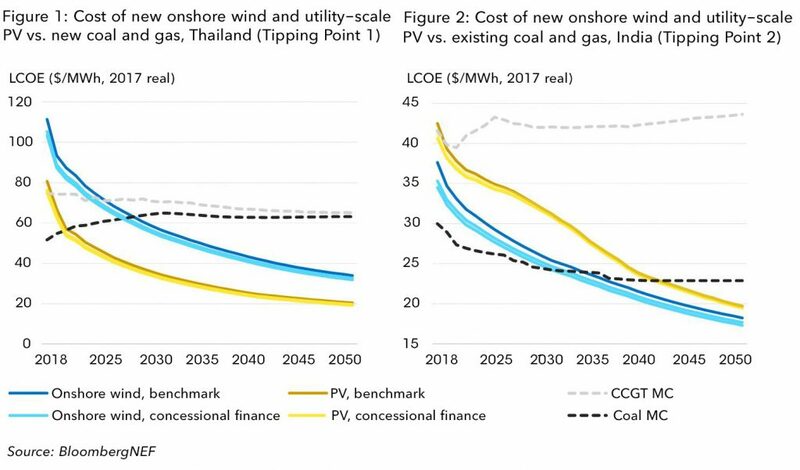 In Thailand, for example, concessional finance has the potential to reduce clean energy costs by five to seven percent, which would accelerate this tipping point by two years and prevent new fossil fired plants from being built. When a market crosses this threshold, building a clean energy facility is not only the right thing to do—it’s the most economically sensible thing to do. Tipping Point 2: When building a new clean energy facility becomes cheaper than running an existing gas or coal plant. Longer term, to address climate change, some of the existing dirtiest sources of power will need to be replaced—without sacrificing countries’ development goals. In the case of India, which installed a coal-fired fleet one third the size of the United States’ in just five years, BNEF found that concessional finance could bring forward this tipping point for new wind plants by as many as four years. This is a critical step towards the deep de-carbonization needed to reach a 2-degree world, as there are hundreds of gigawatts of coal capacity that will keep running for decades unless a more profitable choice is available. The report also found that there is vast potential for concessional finance to create markets for next-generation low-carbon technologies, in particular batteries. As generation from intermittent sources such as wind and solar grows so does the need for grid flexibility and energy storage. While batteries are still expensive, BNEF found that the higher the cost of a technology, the greater the potential impact concessional finance can make. For a lithium-ion battery project, reducing capital costs by even one percentage point can reduce energy generation costs by $10/MWh. The report also looks at the impact of an approximately $750 million share of concessional funding from CTF across the following five countries: Chile, Kazakhstan, Mexico, Morocco and Thailand. Established in 2008, the $8.3 billion Climate Investment Funds is one of the largest climate financing instruments in the world. CIF provides developing countries financing for climate-resilient and low-carbon development. These grants, concessional loans, risk mitigation instruments, and equity leverage significant financing from the private sector, MDBs, and other sources. Five MDBs—the African Development Bank (AfDB), Asian Development Bank (ADB), European Bank for Reconstruction and Development (EBRD), Inter-American Development Bank (IDB), and World Bank Group (WBG)—implement CIF-funded projects and programs.